"This mig welding vid is one of the better ones I have seen "
Steve Bleile’s mig welding video - gas metal arc welding. This video is used by many welding schools and shops across the world as an introduction and refresher to mig welding basics. As I mentioned on an earlier web post, I bought several of Steve Bleile's welding videos and this one, Mig (GMAW) welding, Is a knockout. Gas metal arc welding is more commonly called MIG welding but is also referred to as GMAW, wire feed welding, wire welding, and wire gun welding. The arc shots are clear and informative. Like any mig welding video, it includes the obligatory CYA safety instruction at the beginning but welding safety really is important and I think we have all come to expect it in any training video. 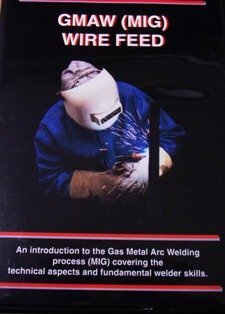 This mig welding video DVD includes a menu with chapters so that certain topics are readily found without having to fast forward or rewind a lot. The topics are broken down as follows. * Horizontal, Vertical and overhead welding. Steve breaks it down in very simple and easy to understand terms and he is right on the money with almost everything he teaches. He is obviously speaking from a perspective of “having done it before”. No high tech technical terms or textbook gobbledygook. His emphasis on things like a good ground and the difference between pushing and pulling are excellent and well explained. Leaves the impression that all vertical welding is done downhill. "Steve does a good job explaining mig welding techniques "